This entry was posted in Tips & Tricks and tagged Code Analysis, Code Navigation, UML. Bookmark the permalink. There might be a missing key here… This only works for me when i press shift+ctrl+alt+u. I think there is missing more than just a key … because shift+ctrl+alt+u is not the function mentioned. The “show class hierarchy” action displays the UML diagram as a popup and not in a new editor tab as shift+ctrl+alt+u is doing. Is this function implemented in IDEA 8.1? Sorry, it was a misprint. Actually, this feature will be in 8.1.1 and it exists for a long time in Maia’s EAPs. Cool, are you going to put this in Resharper too? 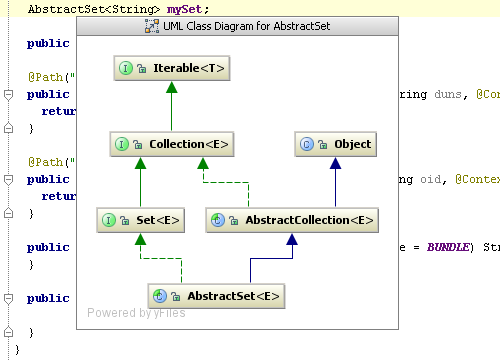 Is it possible to use the uml feature of intelli-j for flex development, too? I just tested the new feature with the latest EAP release of Intellij. It’s quite useful since you can see the whole class hierarchy at a glance. But I’m wondering why the popup takes 1 second to appear after pressing ctrl+alt+U. Is that normal? @Scala users: It seems that the feature also works for Scala (at least a bit). The Scala classes are already drawn but the arrows between the classes are missing. It’s time necessary to build UI and relationships. I’ll do my best to improve performance in next EAPs. Is it possible to show the interaction between cooperating classes ? How is this better than Code Navigator http://plugins.intellij.net/plugin/?id=3202 ? Is it possible to show a diagram of a class and all its implementations (rather than its parents)?